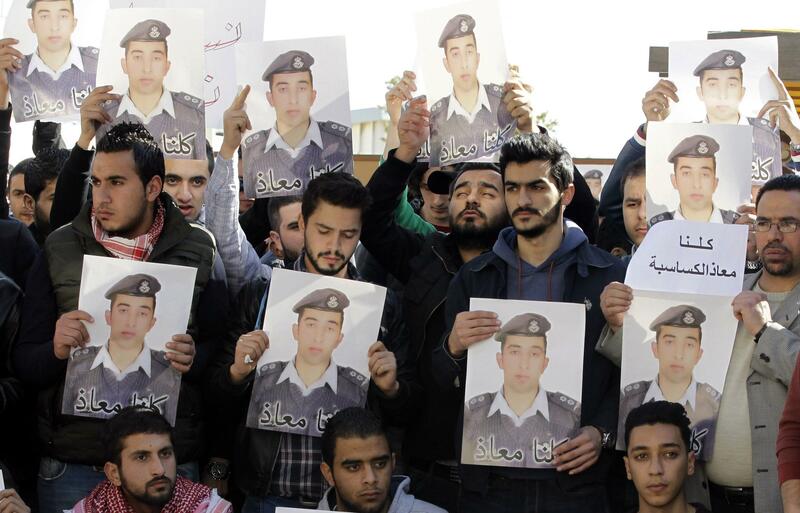 Activists carry posters with a portrait of Jordanian pilot Maaz al-Kasasbeh during a rally in Amman on Feb. 3, 2015. In response to the horrifying killing of Jordanian pilot Moaz al-Kasasbeh, Jordan has hanged two Iraqi jihadists, including Sajida al-Rishawi, the female attempted suicide bomber whose release ISIS had demanded in exchange for Japanese hostage Kenji Goto, before they beheaded him last week. The Jordanian government had demanded proof that Kasasbeh was alive before considering Rishawi’s release. Given that officials now believe ISIS killed the pilot weeks ago, the government’s suspicions appear to have been justified. Normally, state-sponsored revenge killings are the sort of thing that are frowned upon by the international community, but U.S. officials seem optimistic that Kasasbeh’s death will “have an electrifying effect” on Jordan’s participation in the U.S.-led coalition against ISIS. “The King feels that the gloves are off,” Sen. Lindsey Graham, who met with King Abdullah this week, told Reuters, approvingly. And a Jordanian government spokesman vowed that the country will deliver a “strong, earth-shaking and decisive” response. That would be welcome news to the Obama administration, which has sought to emphasize the participation of Sunni Arab governments in the anti-ISIS coalition but has seen the number of those governments actually participating dwindle. Four Arab governments—Bahrain, Jordan, the United Arab Emirates, and Saudi Arabia—have participated in airstrikes against ISIS, but Bahrain hasn’t actually dropped any bombs since last September and the New York Times reports today that the UAE disengaged from the fight in December after Kasasbeh’s capture, fearing a similar fate for one of its own pilots. The question now is what form the Jordanian response will take. Despite the tough talk coming out of Amman today, the government may be limited in its options. There was already strong opposition to the airstrikes in Syria before Kasasbeh’s killing, and while some may see this as grounds for revenge, others will see it as an indication of the risks of joining the American-led fight. Jordan has so far avoided the societal upheavals seen in other Arab countries since 2011, but the government may still be cautious about actions that could provoke more public anger. The stakes of the ISIS conflict were always higher for Jordan than for other members of the coalition. It’s the only one of the “Arab partner” nations that borders both Iraq and Syria. It hosts more than 600,000 Syrian refugees, third in the world, after Turkey and Lebanon. Roughly 1,500 Jordanians have traveled to Iraq and Syria to fight, according to government estimates, making it one of the world’s leading contributors of foreign fighters to the ISIS cause. Abu Musab al-Zarqawi, the founder of ISIS’s predecessor organization, al-Qaida in Iraq, was born in Jordan, and it is home to a small but significant number of ISIS supporters. Pro-ISIS public demonstrations have been held in the southern city of Ma’an. The U.S. is clearly hoping that the anger provoked by the pilot’s brutal murder will lead Jordan to commit itself more forcefully to taking the fight to ISIS in Iraq and Syria. And a new $1 billion aid plan will add another inducement. Still, for the Jordanian government, the threat of internal subversion by domestic extremists has been considered more serious than the risk of ISIS overrunning the country’s well-defended borders. The government has jailed dozens of suspected ISIS sympathizers, but other opponents of Abdullah have also been targeted under the pretext of the fight against ISIS. Authorities have also made use of expanded terrorism laws to jail members of the opposition Muslim Brotherhood, and critics say that leftists and journalists have been caught up in the crackdown as well. The public anger over Kasasbeh’s death could push the government to go even further, making Jordan a more repressive place and doing little to deal with ISIS itself.